Welcome home to your own slice of heaven! 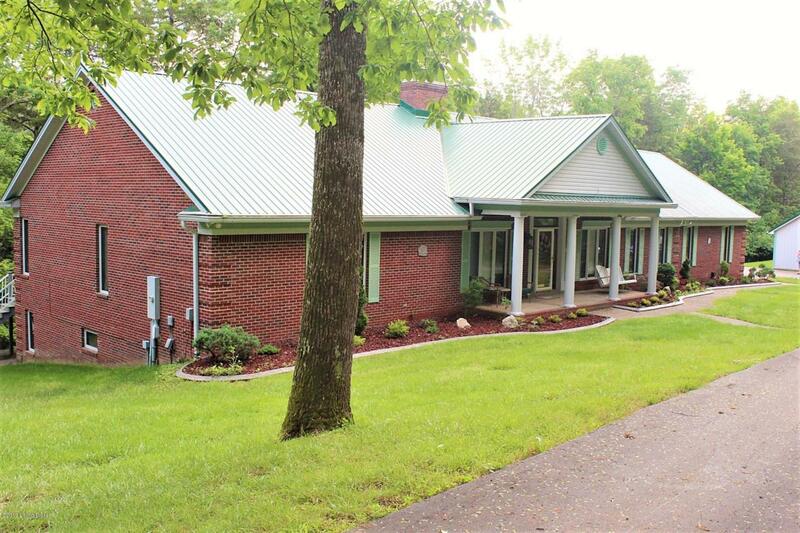 This secluded, impeccably maintained custom home is situated on 5+ wooded acres. Enjoy open concept entertaining with a kitchen that features two islands overlooking a large great room with beautiful hardwood floors, a breathtaking natural fireplace, a built-in entertainment center with a wet bar, and a wall of windows leading out to the large screened-in porch. Walk outside to take in the sights and sounds of nature, with a creek that runs through the backyard.Imagine the joy you will feel this summer sitting out on the porch, drink in hand, the light summer breeze on your skin, listening to the gentle rush of the water while you spend the day relaxing next to the the 18x36 in-ground pool. The entertainer's dream is not complete until you walk downstairs to discover everything the finished walkout basement has to offer. With another wall of windows leading out to a covered patio area, you'll find a second fireplace, a second kitchen area with bar stool seating, second family room area, and game/rec room. Storage will not be a problem in this house. Downstairs there is a large multipurpose room, great for storing your pool equipment, holiday dcor, and more. You will also find three large cedar-lined closets downstairs in the second living area. Upstairs next to the kitchen there is a large walk-in pantry/laundry room, complete with an ice maker and enough room to have another refrigerator. The master suite on the main level overlooks the pool area and has quick access to the screened-in porch. The master has also been redone with new flooring and custom cabinetry for perfect organization in the 8x15 walk-in closet including special touches like drawers for your jewelry, slide out tie and belt hooks, and a built-in laundry sorter. You will find three more bedrooms in the home with a bonus room in the basement, two more full baths and two half baths. Other amazing features of this home include an upgraded metal roof, geothermal heating and cooling system, attached three-car garage, and separate all-purpose storage building (28x36) with an upstairs loft area. Best of all, you can enjoy that quiet country life without giving up quick access to downtown Louisville and the airport. You'll also enjoy a short drive to attractions like Bernheim Forest and downtown Bardstown. Call to make your appointment today!